Jam Cam: The jaminess in this episode is so good that I am presently dreading this recap for fear that I will ruin it. You know this is going to be a great episode when SchemingJam make their first appearance right at the beginning. Jim gets some chips out of the vending machine. Dwight gets some….wha? Omg! It’s Dwight’s stuff — IN the vending machine. Too bad this will be short lived since Dwight can just buy his stuff back with money from his wallet…in J1. SchemingJam is just…wow. Alcohol! It’s a booze cruise! Michael tries to blow everyone’s minds by pointing out the word “ship” is in the word “leadership” and then he does his bad captain routine and can’t even get through the presentation without Pam and Jim making the incorrect nautical movie references. Jim seems so confident Michael will stand in front of the boat and yell “I’m the king of the world,” within the first hour that he’s betting his paycheck on it. At the ship, Michael starts assigning Gilligan’s Island characters for everyone. Pam is Marianne, Jim gets to be The Professor, and Katy is Ginger. Wow, Ginger vs. Marianne. Tough call…or is it? Speaking of pop culture references, Michael is the king of the world as soon as the boat leaves the dock. Jim’s paycheck is safe in his pocket. Inside, Pam, Roy, Jim and Katy sit down and Katy points out that they are so awesome, she feels like they’re at the cool table in high school. Unfortunately, it turns out that Pam was too artsy fartsy to sit at the cool table. Katy, on the other hand, was cool though because she was a cheerleader. Katy and Roy laugh, Jim looks a little horrified, and Pam finds it amusingly awesome. A-W-E! S-O-M-E! But who has time to dwell on the past when there are snorkel shots? I don’t know who invented snorkel shots, but they need to be thanked because Roy is totally enthralled with them — so enthralled he doesn’t notice Pam get her coat to take a breather out on the deck with Jim. Now what can you say without saying anything? There’s a smirk on Jim’s face as he tries to dodge the question and he ends up looking at Pam instead, seriously looking at Pam. The smile on her face fades when she realizes he’s staring at her. There’s yearning from him, apprehensive from her. The words that need to be said seem to be slipping away so quickly and yet the time seems to be standing so uncomfortably still. They’re quiet, still, but so much is going on. Then Pam announces she’s cold, the connection breaks, and she goes back in. I have no idea how all of that could fit into 27 seconds, but somehow it does. Back inside, Katy’s asking Pam how she was able to get her ring. Pam, proving she may know more about her relationship than she thinks, tells Katy to rightfully not ask her advice since she’s been engaged for three years with no end in sight. At the front of the boat, Captain Jack is asking Jim who he would save if the office was on fire. Jim says he would save the customer, but we all think he would really save the receptionist. As Jim walks away with a look of determination, the captain talks about almost dying and thinking about a woman he later married. Roy gets the same look of determination on his face that Jim had. This can’t be good. Oh, but maybe it can! As Jim makes his way over to where Pam and Katy are sitting, he looks straight in the camera and says “You know what? I would save the receptionist. Just wanted to clear that up.” We knew that, now go get her! And just as Jim opens his mouth to tell Pam he needs to talk to her, the sound of Roy’s voice seems to come out of nowhere. Oh no, please no. This is NOT good. Why is it that right at this moment Roy has finally figured out what is most important to him? Somehow, Roy has found the band’s mic and thought this would be the perfect place and time to set a date for his wedding to Pam after three years. Jim’s heart breaks. Hell, all of our hearts break at this moment — except for Pam’s, which looks like it’s ready to burst. She has a wedding date! She’s so happy! Jim is crushed. Jim is so crushed, in fact, that he realizes this whole Katy thing is just something to make him stop thinking about Pam. Unfortunately, he can’t stop thinking about Pam even long enough to come up with something a little more sincere and gentlemanly than “I don’t know why I brought you here tonight. Let’s break up.” Not smooth. Outside, Michael is cuffed to the railing, which is just where Jim finds him when he heads out for some fresh air. Earlier on the deck, Jim really couldn’t find any words to say. This time, he finds too many and confesses his love for Pam to Michael. “She’s really funny, she’s warm, and she’s just….I dunno.” Michael tells Jim engaged ain’t married so he should never ever ever give up. So true, Michael, so true. The Others: Michael decides to get the gang to bond on a booze cruise, but only Meredith and Dwight seem to think this a good idea. There is a reason for this. Apparently, Michael didn’t really think this whole plan through including a boat on a lake in January and the part where he has to give a motivational speech. His analogies about a boat being like the office get so random that even he can’t figure it all out. Once everyone is on board the ship, Michael’s dancing and lack of a motivational plan get him so confused, he’s puking from his vomicilin medication. In the end, the only motivational part of his speech is when he motivates people to think the boat is sinking and some guy actually jumps off the side. The Dunder Mifflinites, however, are still unmoved. What have we learned today, kids: So what if you can’t articulate the words that you need to say? There will be other chances, but take them while you can because you don’t know when your time is about to run out. Never ever ever give up. Dwight: This is not funny. Why is my stuff in here? Jim: Wow, that’s weird. Oh, a dollar for a stapler, that’s pretty good. Dwight: Yeah, well, I’m not paying for my own stuff, ok? I know you did this because you’re friends with the vending machine guy. Pam: Oh sorry. What do I want? What do I want? Oh, a pencil cup. Dwight: Oh, no no no no. That’s my pencil cup. Pam: Um, I don’t think so, I just bought it. Dwight: Uh, I think so and you’re going to hand it over to me. Dwight: Ok, fine. Where’s my wallet? Jim: Um, oh, there it is. J1. Jim: Here you know what? You can have some nickels? Pam: A ski mask and a swimsuit? Jim: So that he can have us rob a bank and then escape through the sewers. Pam: And brush our teeth. Katy: You guys, it’s like we’re in high school and we’re at the cool table, right? Katy: Pam, were you a cheerleader? Roy: No, she was total little Miss Artsy Fartsy in high school. She wore the turtleneck and everything. Roy: Where’d you go to school? Roy: Hey slop who cares-a? We played you. You really look familiar. Did you, you cheered for them, didn’t you? Katy: Yes, I did. A-W-E! S-O-M-E! Awesome, awesome is what we are, we’re the football superstars. A-W-E! [Pam starts dancing in her seat, Jim looks mortified.] Roy: I remember that! Roy: We crushed you like 42 to 10. Everyone: Snorkel shot! Snorkel shot! Roy: Woo! Who’s next? Come on, Pammy, come on, come on! Pam: I’m not doing that. Darryl: Tequila! That’s what I’m talking about. Pam: Hey, why don’t we find like a quieter place to hang out? Roy: You know what, I’ve just gotta wait for Darryl to do his shot. Just a minute. Come on, Darryl! Darryl! Pam: It’s getting kind of rowdy down there. Pam: Sometimes, I just don’t get Roy. I mean, I don’t know. [long pause] Pam: So what’s it like dating a cheerleader? [27 seconds of silence] Pam: I’m cold. Katy: I’d like to be engaged. How did you manage to pull that off? Pam: Um, I’ve been engaged for three years and there’s no end in sight so you don’t want to ask my advice. Jack: Suppose your office building’s on fire. Jim, who would you save? Jim: Let’s see…[Jim looks over at Pam]. The customer because the customer is king. Michael: Not what I was looking for, but a good thought. Jack: He’s just sucking up. Roy: When you were in the Navy, did you ever almost die? [Jim walked away determined] Jack: Oh yeah, yeah, and I wasn’t thinking about some customer. I was thinking about my first wife. The day I got back on shore, I married her. Jim [to camera]: You know what? I would save the receptionist. I just wanted to clear that up. [Jim leans over to say something to Pam.] Roy: Hey everybody, could I have your attention for just a second? Would you listen to me for a second? We were up at the front and we were talking about what’s really important and…Pam, I think enough is enough. I think we should set a date for our wedding. How about June 10th? Come on, let’s do it. 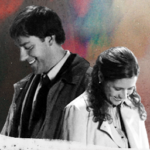 [Jim looks distraught, Pam looks elated.] Roy: Come on baby! Katy: Oh, my God, congratulations! Congratulations. Yes! Roy: I love you baby, come on! Michael: I don’t want to take credit for this, but Roy and I were just having a conversation about making commitments and making choices, right? Did I motivate you? Roy: No, it was Captain Jack. Michael: Could have been either one of us because, pretty much, we were saying the same thing. Congratulations, that is great. Jack: Hey hey hey hey, I got an idea, I got an idea. I can marry you right now as captain of the ship, huh? Michael: Yes, I can marry you as Regional Manager of Dunder Mifflin! Pam: No no no no, I want my mom and dad to be there. Michael: Then I’ll give you away! [watching Roy and Pam dance] Katy: Do you think that’ll ever be us? Jim: Oh right, because you announced that his ship was sinking. Michael: Yea, he just totally lost it. If you ask me, he caused the panic. Michael: Well, it’s nice for you. Your friend got engaged. Jim: She was always engaged. Michael: Roy said the first one didn’t count. Jim: That’s…great. You know, to tell you the truth, I used to have a big thing for Pam. Michael: Really? You’re kidding me. You and Pam? Wow. I would have never put you two together. You really hid it well. God, I usually have a radar for stuff like that. You know, I made out with Jan.
Michael: Yea, yep. Well, Pam is cute. Jim: Yea. She’s really funny and she’s warm and she’s just…anyway. Michael: B.F.D. Engaged ain’t married. Michael: Never ever ever give up.